I have just had the tremendous pleasure of meeting and staying with a couple of blogging friends in Cley next the Sea in North Norfolk. Many of you will know Hanne and Klausbernd from their blog, The World According to Dina. We’ve had a fabulous week of hospitality, photography and great conversations over some lovely meals in this very beautiful area of the country. This entry was posted on July 2, 2016 by Chillbrook. It was filed under Photography, Photography and Travel and was tagged with Adrian Theze, Beach, Cley next the Sea, Cornwall Photographic, England, Landscape Photography, Minimalismism, North Norfolk, Photography, Seascape, Sky. Norfolk – beautiful big skies. Love this photo, look forward to seeing more over the next couple of weeks. My father is from Norfolk so it’s great to see this. Thank you SO much for turning the last week into something very, very special for all four of us! It was great having you here and we are looking forward to more, Adrian. And yes, I can only confirm what you write, everyone should take the opportunity and get to meet fellow bloggers, it’s most rewarding indeed. Thank you from the bottom of my heart for giving me so much advice and teaching how to take further steps as far as photography is concerned. Over the past five years I’ve met six fellow bloggers: four who were visiting Austin (Texas) individually at various times; one when I was in east Texas last year; one when I visited Illinois this June; and one half a world away in Christchurch, New Zealand, whom my wife and I stayed with for three days and had a wonderful time. Let’s hope there will be more to come. It is nice to meet up with fellow bloggers isn’t it. It’s always struck me how clearly people’s characters come through in their blogs. You just know you’re going to get along even before you meet! Beautiful shot. Looking forward to more photos. I know you’ve just recently met Patti and had a similar very positive experience. It really was a feast all round Lynn, thank you! Lovely photo, Adrian. Sounds like you had a great time in Norfolk. What a lovely idea to meet up for real with other like-minded bloggers. That’s amazing. I’m really pleased for you. Fabulous photo indeed and beautifully framed. Top class. I’m glad you enjoyed your stay in Norfolk, Adrian. I know Hanne and Klausbernd very well and have visited Cley several times, it was always a bliss. 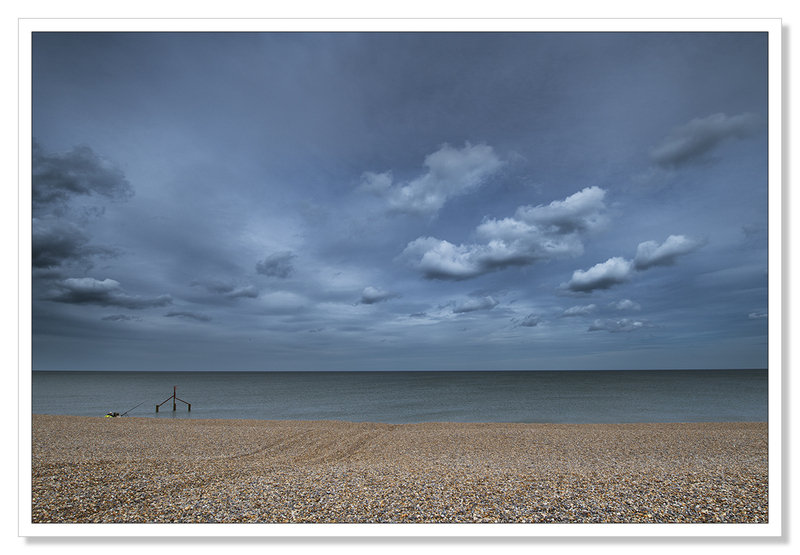 Is this Weybourne beach on your beautiful photo? Fantastic depth to that sky Adrian, and what an unusual colour. Never been to Norfolk, but it’s on the ever growing list. It’s wonderful to meet blogging buddies in the flesh (so to speak). It feels as though you’ve been friends for a long time through their posts, knowing you already have so much in common. It also adds another dimension to their blogs. As for the teaser you gave us. It’s lovely. Can’t wait for more. I’m so happy for you. What great adventures you’re having. Really beautiful beach photo!! Love the moody colours. Looking forward to seeing the rest of your photos! Beautiful, as always, Adrian…will look forward to more treasures from your weekend. And you may remember, that our dear friend, Gunta, and I spent a short afternoon together a few years ago when I was living in Salt Lake City. It was not near enough time, but it was a treat that I won’t forget. Thank you Scott. I do remember you meeting Gunta and I can imagine it really was a treat. There are so many people blogging who I’d like to meet and spend some time with, Gunta and yourself included. You’re very welcome….and that would be quite a treat, Adrian…a real treasure…. Have been following them forever Adrian, how fun that you’ve met! I am in Canada this week and will meet 2 other bloggers I love so agree wholeheartedly that hook-ups w e-friends is terrific. Lovely teaser! Beautiful view and dramatic skies. Your pictures make the cold look so beautiful! In June I spent some time on the shore of Lake Michigan, one of the Great Lakes in the northern United States. Your photograph reminds me of it. Interesting! Somewhere I’ve always wanted to visit Steve. Thank you for your comment! I hope you make it to the Great Lakes.